I am delighted to be here for this second Academia International Conference on Economic and Financial Cooperation. First of all, I would like to thank the Hong Kong Institute of Asia-Pacific Studies of the Chinese University of Hong Kong, for co-organising today's conference with the Central Policy Unit. 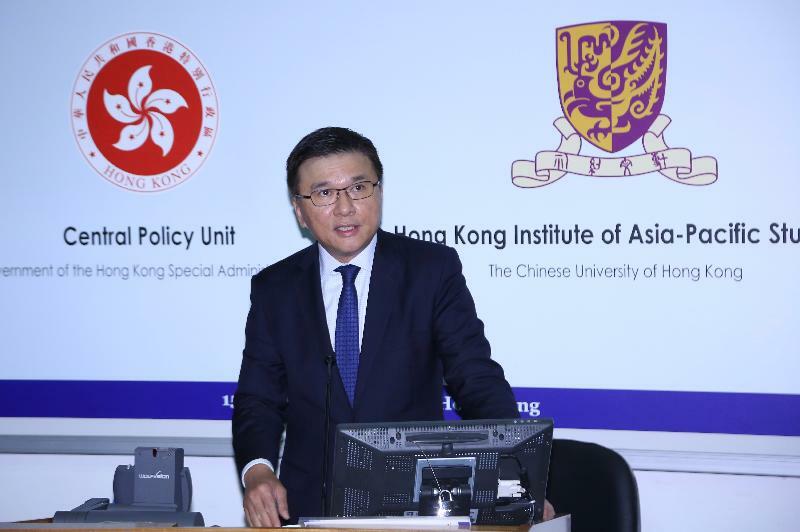 I am glad to see that in the past two years or so, the academia, the business sector and professional services organisations in Hong Kong have organised a series of seminars and conferences focusing on the Belt and Road Initiative. These forums are essential for us to better understand the promising opportunities on all fronts arising from the Belt and Road Initiative. The Hong Kong Government also successfully organised the inaugural Belt and Road Summit in May this year. More than 2 000 senior government officials, policymakers, business leaders and representatives of international organisations from around the world attended this high-level forum. Mr Zhang Dejiang, Chairman of the Standing Committee of the National People's Congress delivered a keynote speech at the forum, highlighting how the Belt and Road Initiative can be the driving force of the global economy in the 21st century, and how Hong Kong can be the marquee player in this far-reaching plan. As all of you would agree, the scale of the Belt and Road Initiative is unmatched, with some 65 nations on three continents championing the Belt-Road, all keen to boost trade and investment through infrastructural connectivity and policy co-ordination as well as stronger people-to-people bonds. To date, more than 100 countries and organisations have shown their support, in one way or another, for this grand and visionary initiative. Infrastructural connectivity is a core element of the Belt and Road Initiative. Huge capital outlays will be needed to fuel the development of the twin corridors. The Asian Development Bank has estimated that Asia overall would need US$800 billion a year from now to the year 2020 for infrastructure investment. The Asia Infrastructure Investment Bank, the AIIB, is a key Belt-Road enabler in channelling funds into infrastructure projects, particularly for emerging markets. The AIIB commenced operation in January this year and so far it has already approved a total of some US$1,100 million in loans for a number of infrastructure projects in Bangladesh, Indonesia, Pakistan and Myanmar, including highways, railways, ports and power plants. As the international financial centre in Asia, Hong Kong can support the AIIB in its financial and treasury functions. We also have the essential expertise, experience and connection to serve as a fund-raising and financial management centre for those big-ticket projects in the pipeline. In July this year, the Hong Kong Monetary Authority established the Infrastructure Financing Facilitation Office, to serve as a designated platform to facilitate the exchange of market information and to enhance co-operation among stakeholders, with the aim of bridging funding gaps and catalysing infrastructure investment in the region. I am glad to note that more than 50 organisations have joined the Office as partners. They include multilateral financial agencies and development banks, public-sector investors and asset managers, commercial and investment banks, infrastructure-project developers and operators, and professional service firms. Hong Kong, of course, has an abundance of financing options that can facilitate the launch of infrastructure and investment projects along the Belt and Road region. Our stock market, among the world's largest, is now tied to the Mainland's Shenzhen and Shanghai markets. The launch of the Shenzhen-Hong Kong Stock Connect earlier this month, together with the Shanghai-Hong Kong Stock Connect set up in 2014 and the Mainland-Hong Kong mutual recognition of funds arrangement, will help accelerate the opening up of China's capital markets and provide more opportunities for investors around the world. As trade and other economic activities along the Belt and Road corridors expand, so, too, will the demand for Renminbi services. Hong Kong can respond to that demand. Hong Kong's offshore Renminbi business got going in 2004, and today we are the world’s leading offshore Renminbi business hub, with a liquidity pool of some 730 billion Yuan. In the first half of this year, some 70 per cent of the world's Renminbi payment transactions were processed in Hong Kong. And Belt-Road investors have a variety of products and services to choose from here, including Renminbi dim sum bonds, cross-border trade settlement and Renminbi financing. Given the substantial Muslim population along the Belt-Road corridors, we expect Islamic financing to grow apace as well. Over the past two years, we have issued two successful sukuk, attracting strong interest from investors in the Middle East and from the world. The two issuances showcased not only Hong Kong's financial dexterity, but also the confidence international investors have in us. And I can tell you that we are now working on a third sukuk. Asset management, risk management and corporate treasury functions will also find demand as the Belt and Road gains momentum. And Hong Kong should be the beneficiary of that, thanks to our track record. Our combined fund-management business amounts to more than US$2 trillion in assets, with close to 70 per cent of the funds sourced from overseas investors. Apart from financial services, Hong Kong's compelling advantages in logistics and professional services will further strengthen our case to be the key link for the Belt and Road economies. Hong Kong is located right in the heart of Asia with a proficient and efficient logistics network. Within five hours of flying time, you can reach half the world's population from here in Hong Kong. Each day, some 1 100 flights connect Hong Kong with hundreds of destinations around the world. And our airport and ports are among the busiest and most efficient out there. Our world-class talents in accounting, architecture, urban planning, engineering management and more, can certainly help meet the huge demand for high-end professional services arising from the planning, implementation and operation of the Belt-Road projects. Hong Kong can also be an ideal centre for resolving potential commercial disputes arising from business collaboration. Given the Belt and Road's multilateral design, and the size and complexity of infrastructural projects, disputes may well arise. With the rule of law and our independent judiciary, Hong Kong's legal professionals are known to lead the field in conducting due diligence, ensuring contract enforcement and helping resolve disputes. We can also help Belt and Road players manage their risks through a wide variety of insurance and derivative products. Ladies and gentlemen, in all this, and much more, we are making our case for Hong Kong's central place in the Belt and Road. Indeed, the Government has been active at the G2G level in exploring collaboration opportunities with other economies along the Belt and Road region. In the past 15 months, we have organised business missions to visit emerging markets along the Belt and Road such as India, Hungary, Poland, Kazakhstan, the UAE as well as Iran. During these visits, we have detailed Hong Kong's advantages as the Belt and Road's finance, investment and project services hub. In short, we have got a lot to contribute, and we want the world to know. Today's conference is another valuable step in that direction. I wish you all a rewarding conference and a happy and healthy New Year.